The beautiful custom home on a one-acre lot at 9230 Brushboro Drive in Brentwood with a fabulous expansion is 4,350 square feet with four bedrooms, three full baths and one half bath. This two-story Colonial home lists at $598,500. This beautiful custom home is situated on a one-acre lot at 9230 Brushboro Drive in Brentwood’s fabulous Foxboro subdivision. With an exceptional expansion, it totals 4,350 square feet with four bedrooms, three full baths and one half bath. This two-story, all-brick Colonial home is listed at $598,500. Built in 1985, large rooms throughout with details like freshly refinished hardwood floors, crown molding, wainscoting, built-in bookshelves and custom drapes make this home a step above the rest. The beautifully updated kitchen opens into an equally inviting dining area that flows into the family room that’s complete with a fireplace that will warm the entire area. The showcase kitchen has new stainless appliances, including a built-in refrigerator, double ovens, and a professional-grade gas cooktop and hood. You’ll find yards of counter space — granite, of course — and Cherry cabinets. The raised bar has room for three stools and the entire space is an entertainer’s dream. Among the four large bedrooms is the master suite, which includes a master bath with a whirlpool, double vanities and plenty of cabinet storage. The bonus room over the gargage includes a built-in office space, perfect for either a home business or as a homework station. The large, bright laundry room includes a dog wash station. Three seasons out of the year, the huge screened porch and covered deck may be the most popular spot in this wonderful home. The porch has a hardwood floor and bead-board ceiling complete with two ceiling fans. The covered deck has a built-in gas grill. Both overlook the spacious and private back yard. Though the house is a winner all on its own, its location is also a true selling point. Conveniently situated just off Concord Road, Foxboro Estates offers ready access to I-65 and popular destinations throughout Brentwood. The well-maintained neighborhood also enjoys plenty of privacy, with large open lots and mature trees. It can be accessed from neighboring BrentMeade and Chenoweth subdivisions, which allows for connectivity not available in many neighborhoods. 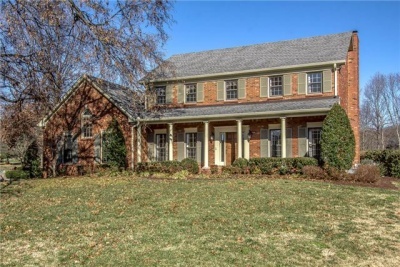 This home is zoned for Edmonson Elementary, Brentwood Middle and Brentwood High Schools in the Williamson County Schools district.